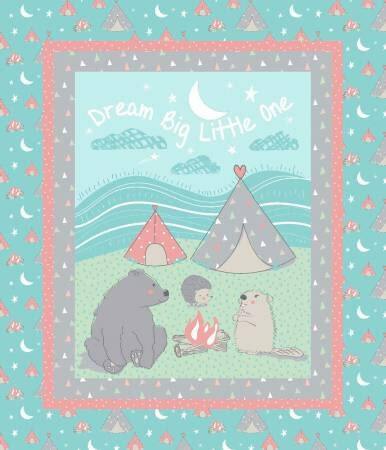 From Springs Creative Products, this cotton print collection features cute animals and and tee-pees. Fabric is licensed and is not for commercial use. Colors include shades of teal, grey, coral, mint, beige, and white. Panel measures 36"x44" Such a fun addition to any baby nursery. All fabrics from The Quilted Nursery Children's Fabric Store is cut directly from the bolt and we now offer fractional quantities for your convenience. Same day shipping always!